Quite some time ago, I launched the first version of the Blog Topics Plugin. I hadn’t updated it since way back in September of 2008. Originally, it was relying on URLs with query parameters for all the portal aspects of the plugin. For instance, if you wanted to link to a page of blogs from one topic, you’d have a URL like, “index.php?topic=1.” It worked, but was less than elegant. So, for our own work, we modified the plugin to use permalinks, and added some additional features. The publicly released version was treated like the forgotten stepchild. Lots of people have downloaded it and I think lots of people have used it. It continued to work, but it got no love. Not anymore. I’ve now completed a long overdue overhaul of the plugin. Now, all the portal aspects can be switched on and off in the widgets. And, I’ve provided some sample theme code to show how to use the permalinks (which are written into the theme, not the plugin). So, let’s run through how the plugin works now. The plugin comes with a bunch of files. So, let’s break down where they go. This is where the main part of the plugin should be installed. You need to install the cets_blogtopics.php and the cets_blog_topics folder (and the files within) in the mu-plugins directory. The cets_blogtopics.php file should be in the root of the mu-plugins directory or the plugin will not run. All of the code in the cets_blog_topics_sampletheme directory is, as the name suggests, sample theme code. To test it and play with it, install it in the wp-content/themes directory. You will need to enable it via Site Admin -> Themes, and then you will have to activate it on a selected test blog. You should install this AFTER installing the plugin and widgets. The theme utilizes the cets_bt_topics_with_posts widget and the cets_bt_featured_topics_with posts widget. Now you have the files where they belong, now what? For a fresh install, the plugin will create a couple of tables in the database. The names will most likely be wp_blogs_cets_topic and wp_blogs_cets_topic_relationship. (The first part may be different if you’ve customized your database prefix in your WPMU install.) In previous versions, the table names used plural syntax. Plural syntax of table names is just one of my many pet peeves about the database design in WPMU (don’t get me started on that). There are a few new fields as well – description, slug, thumbnail, banner, and featured are all new in the topic table. (Thumbnail and banner aren’t actually in use yet.) If you already had the plugin installed, the upgrade script will attempt to alter the tables for you automatically. By default, you must have at least one topic. The plugin installs with the default topic of “uncategorized.” If you’d like it to install with multiple topics, you can alter the code of the cets_blogtopics.php file on line 120 to add additional items to the array of default topics. Don’t worry – there’s a visual way to add and edit topics once the plugin is installed as well. The second part of the administrative interface allows you to set a featured topic. Again, the featured topic is utilized in the sample theme code and in the featured topic widget. A featured topic is not required to run the plugin, but is required for the featured topic widget. The final part of the site admin interface is the uninstall feature. Clicking the uninstall link will remove the database and clean up the site options associated with the plugin. Manual deletion of files is still required. It defaults to selecting the first item in the list, which is in alphabetical order. We’ve noticed that some people don’t really pay much attention here, and will just sign up with the default option, no matter what it is. 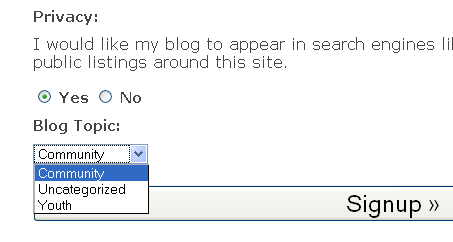 Fortunately, there’s an easy way for blog admins to change the selected topic. In Settings -> Blog Topic, blog admins can change the topic of their blog and decide whether or not their blog should be included in the aggregation bits of the plugin. Okay, so we have the plugin installed, and we’ve categorized our blogs. Now what? What do we DO with that information. Here come the widgets. There are five of them. Some are incredibly simple – and could be used on any blog in the network. Others are really meant to be a part of your root blog, acting as portal pieces. Let’s start with the simplest one first. Back end view of blog topics name widget. Pretty simple, right? Yah, we don’t actually use this one, either. But, it was written, so I thought someone might want it. And, here’s how it looks from the front end. That image in there? That’s part of the sample theme code. We’ll talk about that in a minute. Whew – are you still with me? One last section – the sample theme. First I have to ask you a favor. Don’t just install this sample theme and run with it, okay? I tried to dumb it down enough so as to not be too tempting. It’s pretty bare bones. It’s really meant as a guide – a way to help you understand how to make all this portal stuff work. Okay, that said, how does it work? Where’s the magic? Of course, you also need the topic.php and the sites.php files as well. These are the files that display all the recent posts from a topic or all the sites from a topic. I’ve tried to add commenting in each of these files so you know what’s going on there. Note that, as written, these files also make a custom feed link. If you want to use that, you’ll need to also use the topicfeed.php file. The home page is really just a widgetized template that utilizes the Topics with Posts widget and the Featured Topic with Posts widget. The widgets are called in home.php using the nifty the_widget() function. But, they could also be set via the back end widget tools. My cohort in crime, and designer/css guru, Kevin Graeme, has added some nifty css tricks to the sample theme. Remember that image in one of the widgets up above? Well, that’s just a little css trick based on the slug of the topic. If you check out style.css right about line 281, you’ll see a comment that tells you what to do if you want to implement that trick. You’ll need to create a style for each of your topics. Easy peasy. Okay, I think that’s it. Hopefully, this will help you figure out how to use all this stuff. I’ve released a new Google Maps Embed plugin for WPMU (and should work fine for WordPress as well). It uses the link generated by a Google map instead of the API key, for those users or those situations when using an API key is overkill. I threw a couple of new widgets out there for folks to have some fun with. We use this one together with Donncha’s sitewide tags plugin, so we can have a tag cloud on your site’s home page that references the tags from the tags blog. The shortcode just allows you to pass in the ID of the blog you want, otherwise it acts pretty much just like the built-in shortcode, but with the defaults set a little differently – you can set the defaults directly in the code if you prefer different ones. This widget lets you pick a featured blog and a featured author within that blog, and it will display the avatar of the featured author and a user-specified number of posts from the blog. Both of these came out of the work that we were doing on an internal blog server – so they might be a tad bit customized in terms of layout. But, they’re good starting points if you need to do something similar. 1.3.2 release – It came to my attention that the core function get_blog_list does not include private blogs. So, I swapped out that code for a direct database call to get all blogs that aren’t spam, mature or deleted. I also streamlined the behind the scenes dashboard updates for a bit more efficiency. My coworker discovered another bug. (Thanks, Kevin.) Apparently, after a user created a new blog, they were being directed back to the main blog on the congratulations page.The latest version fixes that issue.